After reading "Waiting for an Angel" I fell in love with Helon Habila and decided to read more of his works. He is such a splendid writer. A very good one for that matter. "Measuring Time" is the story of a twin brother, born in a weird family circumstances. Their mother died during labour and their father couldn't care less. returns from the Biafra war and commits suicide in their family home. They decide to leave the country and only LaMamo, the healthy one, succeeds. That is how they are separated and started life apart. LaMamo joins a militia, fighting in Libya and then ends up in Liberia. While, Mamo due to his delicate health stays behind and tries to make a decent living and fight injustice through writing. This novel sort of narrates on their lives apart, a comparison perhaps? "Measuring Time" is a very well written novel, though I did not enjoy it as much as "Waiting for an Angel". In my opinion, there is a lot going on and each of them could have perfectly become an independent story worthy of a novel. Let me also add that Helon did a wonderful job weaving them together. I HIGHLY recommend. 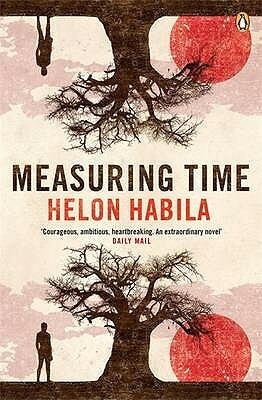 Believe it or not Helon Habila is such an extraordinary novelist. I look forward to reading more of his novels. Have you read this novel or any of Helon Habila's novel? What is your opinion? I've read all his books and published the Nigerian edition of his third novel, Oil on Water. Helon can be said to be an important writer. His words contribute to the growth of African literature. Interesting, I'd like to read that one too. He is indeed an important writer. No doubt! Nice review, Mary. Meaning to read his works. you should, and I cannot wait to read your thoughts! Thank you. "Waiting for an Angel" is awe-inspiring. Read it if you have not yet.